For my second project I was given a task to recreate parts of an art gallery into a virtual world. Before I get into that, let me give you a little history behind the project. The software that I am using to achieve this project is Unreal Engine 4. This program was used to make several well know games such as Bioshock Infinity , Boarderlands 2 and Dishonored . Unreal was one of the first programs that provided a level editor for FPS (First Person Shooter) and had extensible C++ core that allowed better control and manipulation within the game (Herwig, 2002). Unreal is a free program that provides people with the necessary tools to develop a game (Unrealengine.com, 2016). It is not only limited to computer games, this engine can also make games for mobile, console and virtual reality (VR). The program provides a variety of sources such as basic props, meshes, objects and many more. Unreal has also created many different platforms to help people get started with the program, from tutorial videos to wiki pointers. Unreal Engine has also created a strong community base within the people who uses the program. Allowing everyone to help and share information about what they have discover and what needs to be adjusted. Now coming back to the project. The gallery that we are trying to recreate is called the Yellow House Gallery. A gallery back in 1950s that displayed works by John Olsen, Robert Hughes and Robert Klippel (Yellow House Sydney, 2016). It housed different works that ranged from painting, sculptures, films, and interactive projects. University Of Wollongong Library is working together with the gallery and trying give it a modern twist. 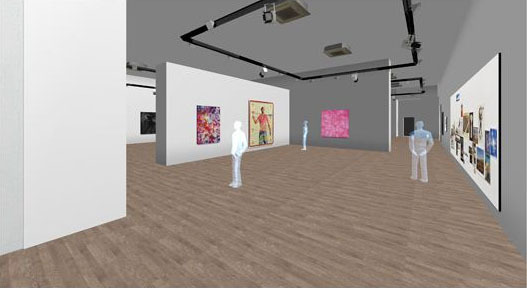 People would be able to explore the gallery with the use of a virtual reality headset such as the oculus rift. From my experience with the program it takes a lot of trial and error. I have never used any program that was like Unreal and I was worried that I would not be able to use it all. Thankfully the video tutorials that unreal provides are insanely helpful. Also the wiki page that they have helped me answered most of my question. I tried to create a room first before actually trying to recreate an aspect of the gallery. It can be frustrating at time because sometimes I don’t know what went wrong. I had to restart the project at least 2 to 3 time because the changes that I had accidentally made were irreversible. It was good to actually try and make a demo model first because it allowed me to become more familiar with navigating in the system. Also the tutorial that was guiding me through this process showed me how to create and make extra things within the game. Now on wards to the actual gallery itself. I had decided to do the staircase from the gallery and it was quite the challenge. Some parts of the stairs I had to build manually because there were on other options. It was made shape by shape and it took forever to get it done. I had to also manually make sure that it was all align and that itself took a few hours to do. It was interesting doing this part of the gallery as I needed to be creative with shapes to try and recreate the area. I also experimented on several different things to try and recreate the walls of the gallery. Since nothing in the unreal had anything similar to the wall I decided to try and recreate it. Following some videos and looking through wiki I manage to make it and I was also most identical to the gallery. Finally adding some of the pros in the gallery became a little harder to do because I had no idea how I was going to recreate it. Instead I went on sites such as TuboSquid that provides some free objects that can be transfer to unreal engine. However I was still unable to find some of the objects I needed. Then I thought of how the objects that are imported are just 3D objects. I went on Thingiverse a site that provides models that can be 3D printed. I downloaded it and saved it to a file that can be transferred to Unreal. That solved my problem and made it a step closer to how the gallery will look. Overall the experience with Unreal Engine has been amazing. It also can be very addictive as sometimes it takes hours to do one part but because you want to make it perfect. You are willing to invest into it. This is the overall look of the parts I have tried to recreate and from someone who had no idea how to use the program I am happy with it. Herwig, A. and Paar, P., 2002. Game engines: tools for landscape visualization and planning. Trends in GIS and virtualization in environmental planning and design, 161, p.172. This is awesome! I am so happy to see people delving into new areas that they never would have otherwise! Its clear you didnt have any experience with this since you described your entire journey, and I respect that alot. Ive been going through that alot in the Digital Media major, finding new programs and just deciding to go for it and learn something new. Its definitely confronting, but so worth it. Im glad you figured out how to use it, the images you provided are hlpful in understanding your experiences. Your end product actually looks so good considering you just learnt this, I feel like it would take me weeks and weeks to even consider making something like that! I’m almost tempted to play around with this program now, but I dont want to be addicted to it for hours haha! All in all, im very glad you decided to just go for it, and learn something new. Very satisfying to see and now you have some new skills 🙂 Definitely an important aspect of this course, and you nailed it. Your post was awesome and I loved the detail that you put into the work you are doing. You laid out the post so well with the images and it really helped my see how far into VR you delved! the fact that you learnt all of this from the group up with no previous experience is a testament to your determination and It shoes in how well the world you are creating is coming together. Good job! I’m just watching your presentation now and once again I am amazed at you ingenuity in actually creating the building from scratch instead of just superimposing images. The fine details are going to take up the most amount of time but you seem to really be chugging along with it. I especially love the angle you are taking with the sculptures and what not. It’s Lit! I’m fascinated with how much detail goes into this kind of work and how it took you so much time and effort to come up with the finished product. The fact that you had no experience with it before just proves how dedicated you are to the project and including a lot of images to show your progress also proves how much you have improved. Also, these images show how the world is coming together. It really adds to the overall project and I find it to be quite immersive no matter how small the world may be. Reblogged this on the change is coming. Next Post Social Utility: Are Chores Really Fun?